Alex Smith investigates a four-berth express cruiser you can tow behind your car. 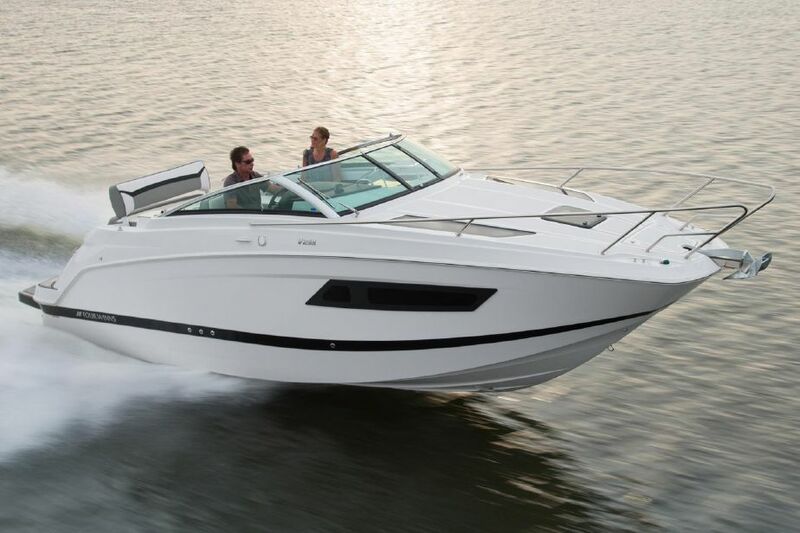 Four Winns is no stranger to leisure boaters with big demands and modest budgets. 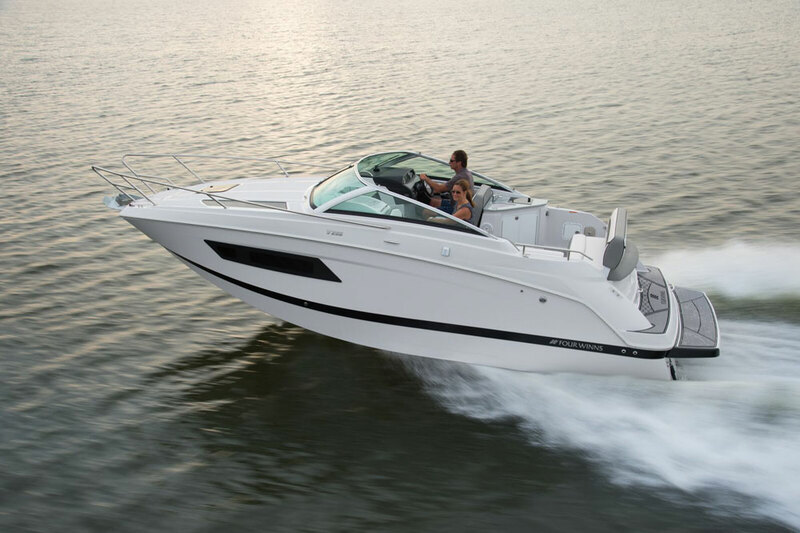 It currently makes around 50 models of powerboat from 18 to 50 feet in length, encompassing everything from traditional bow riders to slick tow boats (see: Four Winns TS222 First Look Video), hard-working cuddies, high-spec sports cruisers and broad-bowed deck boats. It’s a varied and complex fleet and yet the Vista stands out as a line with a particularly challenging job to do. 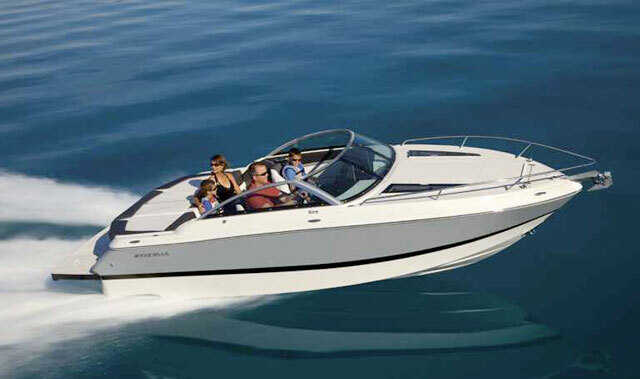 This compact, six-strong series of express cruisers is designed to combine modest size and sporting performance with authentic comfort and cruising potential – and as the smallest of the Vista craft, the V255 is quite naturally the one required to strike the most difficult balancing act of them all. 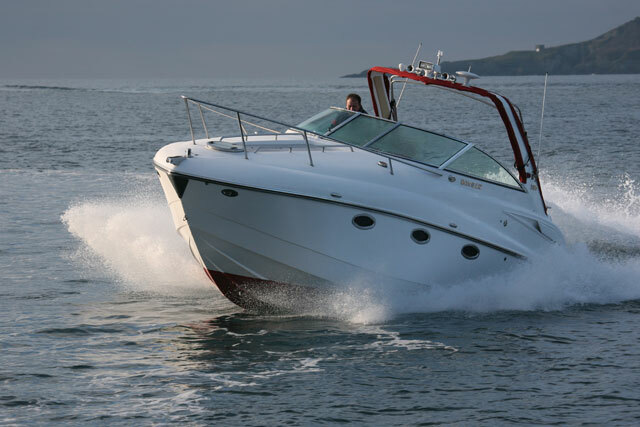 Despite its fulsome cruising aesthetic the Four Winns V255 is a genuinely good-looking boat. 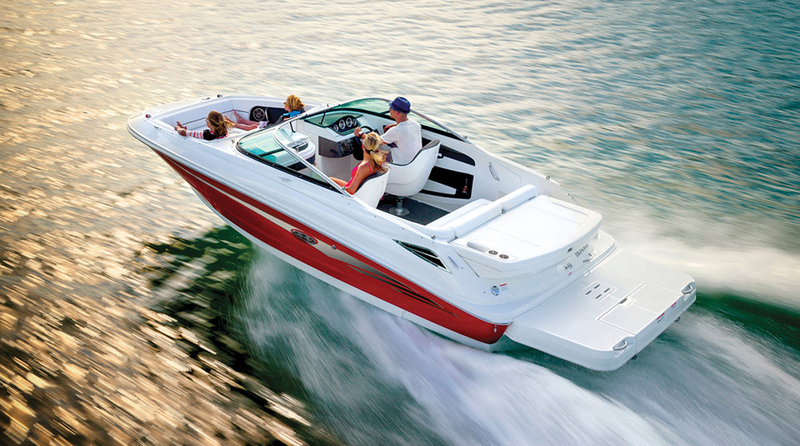 Despite its broad, squared off bow, the V255 is a good-looking boat. The designers have been particularly clever in the forward sections, using dark, obliquely angled window sections on the hull and topsides, allied to an upward sweeping guardrail mirrored by a parallel hull graphic that counteracts the slight dip of the impressively flat foredeck. Far from appearing to strain at the seams, as is so often the case with small cruisers, the overall impression here is one of modest but sporting potency. Step up into the cockpit and its victory at the European Powerboat of the Year Awards continues to feel more or less justified. 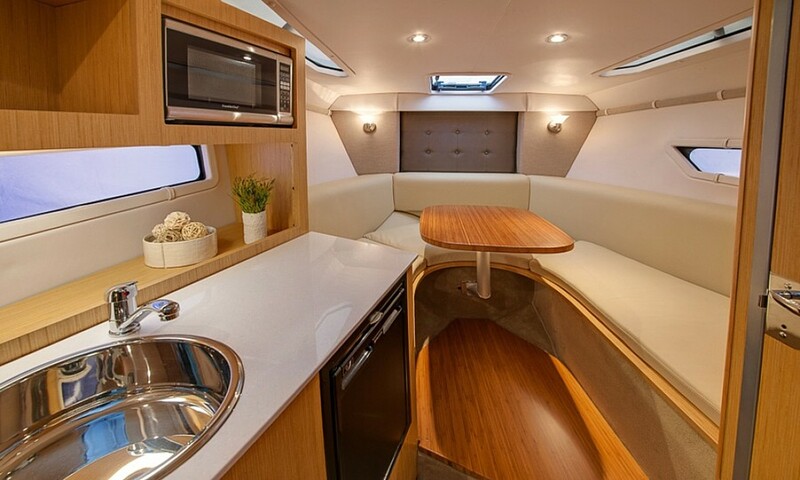 The helm comes with a broad bolster-equipped bench seat that backs onto a triangular wetbar, providing a sink, mini stove, compact work surface and fridge, without inhibiting access to the starboard transom gate. 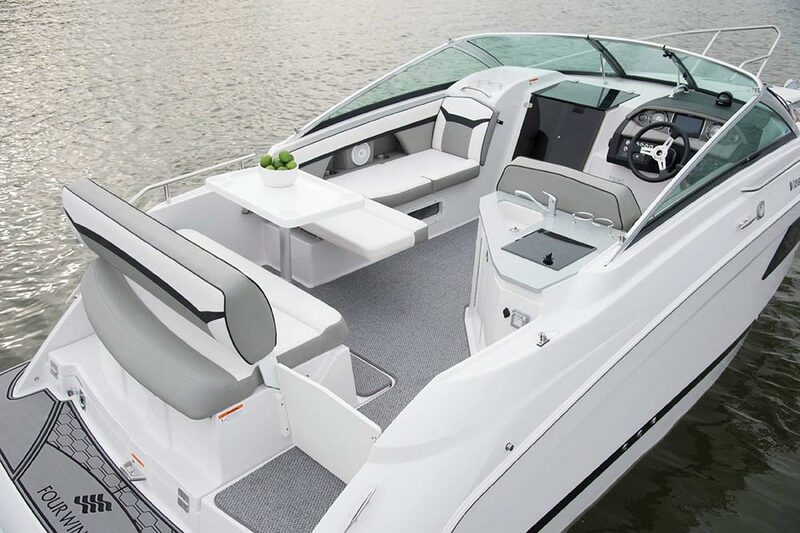 The use of a compact aft-facing port lounger rather than a traditional forward-facing navigator’s seat also means you get fixed steps to the foredeck, as well as a swinging door with upper hatch to grant access to the cabin. Not only does this make it easier for a big man to get down below, but with its tinted see-through panels, the door arrangement also enables much better light ingress to the accommodation spaces. Take a look at the boats.com First Look Video below. However, the cockpit’s real high point is all about the port quarter, where the unbroken, wraparound L-shaped seating section can be reconfigured to generate a compact, four-man, face-to-face dining station. This uses a rectangular plastic table with moulded cupholders and a single, angled post to avoid compromising legroom. The swinging bench mechanism with its fold down metal supporting stanchion is quite stiff and rudimentary but it works reliably enough and adds a useful dose of versatility to what might otherwise feel like quite a formulaic space. The V255 cockpit is impressively versatile, particularly in the convertible port quarter. Down in the cabin, the accommodation continues to make very effective use of the available length. The main convertible double berth is cleverly angled, generating space not just for the standard dining area, but also for a dedicated galley to port and a separate full-height heads compartment to starboard. There’s also a transverse queen-size double beneath the helm station, complete with a pair of privacy curtains and some impressive headroom at the point of access, courtesy of the navigator’s aft-facing lounger on the port side of the cockpit. 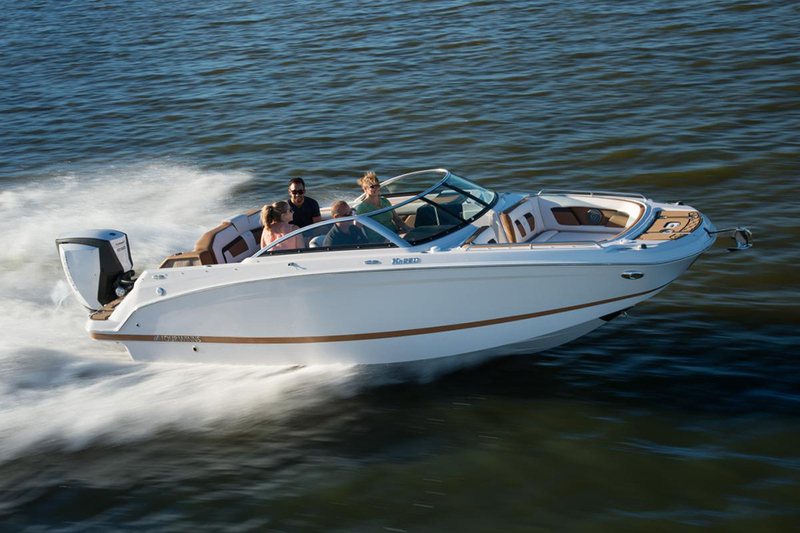 It looks like a distinctly generous set of cruising features for a boat of this scale and happily, rather than complicate the experience, the standard package is very well considered, creating a ready-to-go leisure boat without unduly inflating the price. It comes with the cockpit carpet, shore power, a water heater, a transom shower, a cockpit cook plate and a microwave and fridge in the cabin. It also comes with several less likely (but fundamentally necessary) provisions, like a compass, a depth sounder, a helm bolster, a cockpit table, a set of trim tabs, a windscreen wiper, a bimini top and a camper canvas. The base engine is a 250hp Mercruiser 4.5L but you can upgrade that to the 280hp Volvo Penta V6 or the 300hp Mercruiser 6.2L. And if you want to go further, the options list is long and accessible, making customisation a very easy process. The four-berth accommodation with standalone heads compartment is a real highlight. My only real issue is with the finish. There are several areas where the materials look and feel a bit cheap and lightweight and where the care lavished on the fit-out seems a long way short of fastidious. A good example of this is the point where the forward bulkhead of the heads compartment meets the contoured cabin edge. Rather than meeting flush (as you have a right to expect), the gap between the two surfaces fluctuates over its length to as much as 12mm. Of course, it’s by no means a critical flaw, but if I were spending the best part of £100,000 on a 25-foot sports cruiser, I would want to see a lot more attention paid to the small things than that. As its recent international award suggests, this clever, four-berth boat is staking a big claim as a genuine mini-cruiser on a compact cuddy footprint. It brings you the practical assets and overnighting pleasures of a modest cruiser alongside the logistical simplicity and user-friendliness of a trailer boat. The finish on the show craft in Dusseldorf was certainly lacking in parts, but if subsequent production models are able to demonstrate more in the way of care, I have little doubt that the much-vaunted V255 has the merit to back up its lofty reputation. The standard package provides everything you need without unduly inflating the price. 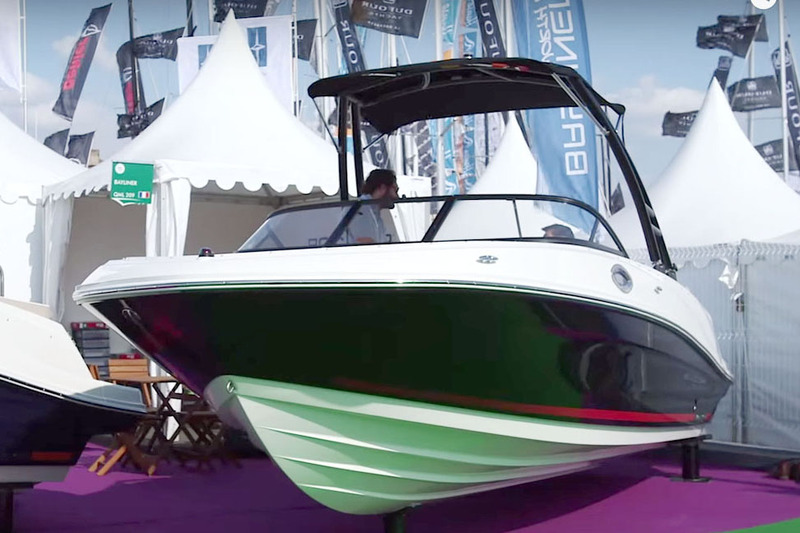 Potential buyers need to ask themselves whether the compact size of the V255 is more appealing to them than the accommodation, because there are few boats that offer both attributes. 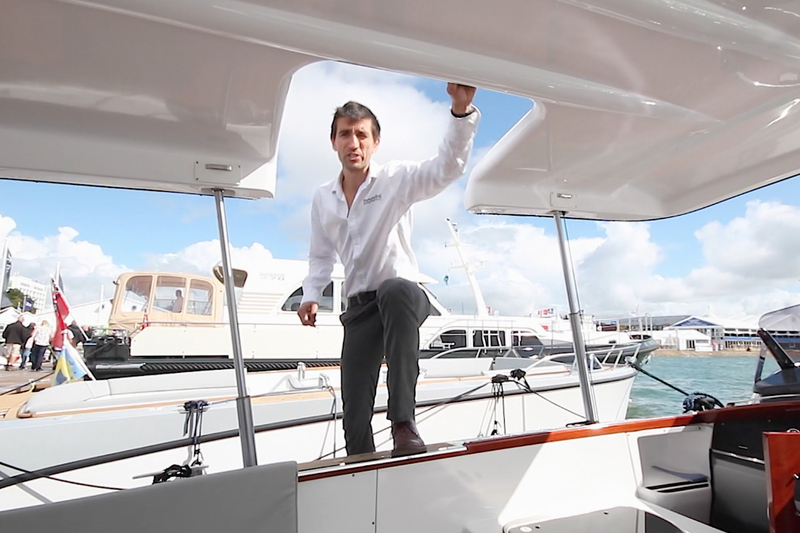 Around the 25ft mark, we have First Look Videos of the Cormate T27 or the Alfastreet 23 Cabin, but both have two berths only. For four-berth options, take a look at the Rodman 890 Ventura or the Bavaria Sport 330 Open – both of which are considerably longer (and pricier) boats.